In last session we have learned how to create IAM users and groups. If you missed that please go through it, if you required. To assign policy to group, we will need ARN which is Amazon unique resource name. To get ARN of particular policy got to AWS management console by navigating IAM->Policies then click on 'Administrator Access' policy to get ARN of this policy. Lets assume we want to use 'Administrator Access' policy for IAM group but we can select any other policies from AWS console as per our requirement. 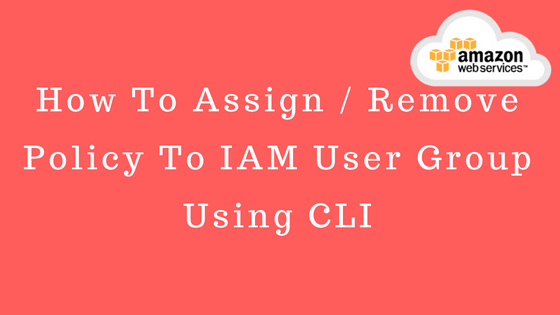 We can use command below to remove any user from IAM group. Please make a note, before executing this command we need to detached policy of this group otherwise it will throw error. Like "An error occurred (DeleteConflict) when calling the DeleteGroup operation: Cannot delete entity, must detach all policies first." So lets first remove policy from this IAM group using command below. After executing this command, this group has no users and policies assigned to it. Now we are ready to remove this IAM group using CLI successfully. We can verify this group from AWS console once it has been deleted.